Lead is a bluish-white metal of bright luster. It is soft, highly malleable, and ductile; it is a poor conductor of electricity. Lead resists corrosion; in fact, lead pipes bearing the insignia of Roman emperors that were used as drains from the baths are still in service. In addition, lead is used in containers for corrosive liquids (such as sulfuric acid); it may be toughened by the addition of a small percentage of antimony or other metals. These bands are not pathognomonic, and the differential diagnosis for cases involving opaque metaphyseal lines is wide and includes poisoning with other heavy metals; hypervitaminosis D; and the healing stages of leukemia, rickets, and scurvy. A normal skeletal radiograph does not rule out lead poisoning in children. The classic findings of lead lines on radiographs of long bones are rarely seen because most cases of lead poisoning in children are due to exposures to low or moderate amounts of lead. In select cases, abdominal radiographs may demonstrate paint chips or other objects. The presence of lead foreign bodies in the gastrointestinal tract (caused by pica) may highlight the diagnosis and prompt immediate intervention. Plain abdominal radiographs may also guide therapy (eg, by allowing the prevention of further absorption through gastrointestinal decontamination). Neuroimaging is expensive and the availability may be limited. Young children undergoing CT or MRI may need heavy sedation or general anesthesia. A finding of disruption of brain plasticity, as seen on MRIs, is not a finding unique to lead intoxication. Other clinical disorders, such as metabolic and epileptic encephalopathies and psychosocial deprivation, may be associated with disrupted brain plasticity. Several mental retardation syndromes and cognitive disorders have been recognized as being secondary to genetic disruption of intracellular signaling cascades. Lead poisoning. Pica. Plain abdominal radiograph in a 3-year-old patient shows multiple metallic particles due to ingested flakes of lead paint. Lead poisoning. 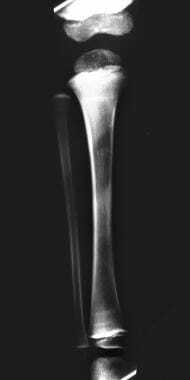 Opaque metaphyseal bands in the lower femur, upper tibia, and the upper fibula secondary to lead poisoning in a child. Albers and Bromberg reported a case of X-linked bulbospinomuscular atrophy, or Kennedy disease, masquerading as lead neuropathy. They described a 43-year-old man who was referred by a veterinary surgeon who evaluated the man's dog for a seizure; the veterinarian suspected a toxic lead exposure in both the dog and its owner. The patient had worked on refurbished houses, removing old paint, and complained of decreased cognition, fatigue, and muscle cramps. He had a depressed affect, postural tremor, right-arm weakness with partial denervation on electromyelography, and borderline-low sensory nerve action potential amplitudes. A mild anemia and elevated serum and urine lead levels supported a diagnosis of lead neuropathy. Chelation therapy led to an increase in urine lead excretion without symptomatic improvement. The patient's brother worked part-time with him and developed similar findings; in addition, the brother had difficulty chewing and experienced dysphagia, perioral twitching, gynecomastia, and multifocal denervation of extremity and facial muscles. The brother's lead levels were not elevated; an androgen receptor mutation identified on the X chromosome in both brothers confirmed the diagnosis of X-linked bulbospinomuscular atrophy. Mennel and John reported a case of a 23-month-old boy with osteosclerotic metaphyseal dysplasia (OMD). The patient presented with hypotonia, developmental delay, and complex seizures. Radiographs revealed profound sclerosis of the metaphyses and epiphyses of the long and short bones in the extremities, with a unique pattern of distribution. Sclerosis involved the anterior ribs, iliac crests, talus, and calcaneus. The skull and vertebral bodies appeared unaffected. The overall appearances were suggestive of lead poisoning. BLLs were normal. OMD is a rare sclerosing bone disorder inherited in an autosomal recessive manner. The syndrome is clinically characterized by developmental delay of a progressive nature, hypotonia, elevated alkaline phosphatase levels, and late-onset spastic paraplegia. Analysis of the metaphyseal bone changes should help distinguish OMD from lead poisoning and other causes of metaphyseal sclerosis. For excellent patient education resources, visit eMedicineHealth's First Aid and Injuries Center. Also, see eMedicineHealth's patient education article Poisoning. In patients with chronic lead poisoning, opaque transverse metaphyseal bands appear in growing tubular bones. These metaphyseal bands, or lead lines, usually do not occur until blood lead levels (BLLs) reach 70-80 mcg/dL; they are not an early manifestation of lead intoxication. These lines, which are actually growth arrest lines, are not pathognomonic for lead poisoning (see the images below). Lead poisoning. Opaque metaphyseal bands in the upper and lower tibia and the upper fibula secondary to lead poisoning in a child. The lead lines may persist after the lead exposure ends. Normal bone is laid down on the epiphyseal side of the lead line; with recovery, the lead line becomes broader and less dense and may eventually disappear. The band migrates into the substance of bone at a rate that correlates with bone growth. If normal BLLs are maintained, the lead lines gradually decrease in density and disappear after about 4 years. If the lead exposure is prolonged, there may be lack of bone modeling. In children, the density and width of the lead bands are well correlated with the concentration of lead ingestion or inhalation, as well as with the duration of lead exposure. Because lead and calcium are used interchangeably by bone, lead deposition occurs in high concentrations in growing bones; the greatest concentration occurs in the metaphyses, particularly those in the distal femora, ends of the tibiae, and distal radii, because these are the parts of the skeleton that grow most rapidly. Thus, lead lines are most prominent at the knees; they can, however, also be seen in the wrist, in any other long bone metaphysis, in the axial skeleton, and in the margins of flat bones. Single transverse lines predominate, but multiple bands may be seen in cases of episodic lead poisoning. In infants with severe lead poisoning, the bands may be wide and may prevent normal remodeling. In addition, the distal ends of the long bones may disappear and appear clubbed. A bone-within-a-bone appearance has been described. A negative radiograph does not rule out lead poisoning in children. In healthy infants 3 years of age or younger, the finding of increased metaphyseal opacity is not unusual. This may sometimes be pronounced and may lead to a false-positive diagnosis of lead intoxication. This increased metaphyseal opacity is a normal variant and represents exuberant calcification of the zone of provisional calcification. It is often seen in healthy children, especially after exposure to sunlight after winter. Opaque metaphyseal bands are also seen after poisoning with other heavy metals; with hypervitaminosis D; and during the healing stages of leukemia, rickets, and scurvy. Woolf and associates examined 15 Omani infants (2-4 mo of age) who had acute lead encephalopathy and concluded that any young infant presenting with unexplained encephalopathy should undergo radiography of the knee and that, in such cases, the presence of opaque metaphyseal bands strongly supports the diagnosis of lead poisoning. 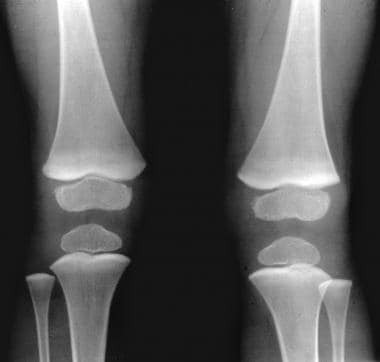 Plain skeletal radiography revealed opaque metaphyseal bands in all 15 infants; these were best seen around the knee joint. In 6 infants, there was evidence of multiple lead lines, indicating previous episodes of exposure to lead. In 4 infants, lead lines were also seen in the axial skeleton. In select cases, abdominal radiographs may demonstrate lead-containing paint chips (resulting from pica) or other lead-containing objects. The presence of lead foreign bodies in the gastrointestinal tract may highlight the diagnosis and prompt immediate intervention. Plain abdominal radiographs may also guide therapy in preventing further absorption through gastrointestinal decontamination. Hu et al measured bone lead levels in 34 adults with no known history of excessive lead exposure and found that bone lead levels were greater in older persons; they concluded that the KXRF technique may help distinguish low levels of lead burden, as shown in epidemiologic studies. The investigators used a questionnaire to gather information about the participants' occupational and environmental lead exposure. A 30-minute measurement with an average estimated uncertainty of 6 mcg of lead per gram of bone mineral was obtained at the midtibial diaphysis. In the study by Hu et al, 18 patients had bone lead levels below the measurement uncertainty. The remainder had BLLs up to 21 mcg/g. Among young adults, bone lead levels greater than the degree of measurement uncertainty were confined entirely to individuals who had grown up in housing that was estimated to have been built before 1955. Such a childhood environment fosters exposure to biologically absorbable lead through the ingestion of dust contaminated with lead paint and water contaminated from lead pipe. Benson and Price evaluated elderly persons who grew up in a high-lead environment in Queensland, Australia, and experimental and neuropathologic studies demonstrated an association between exposure to lead and perivascular cerebellar calcification  The subjects' childhood residence and occupational status provided circumstantial evidence of a relationship between excessive lead intake and cerebellar calcification, as seen on CT scans. Previous autopsy studies have shown that cerebellar calcification is more common in Queensland than elsewhere. Results of cranial CT, which is more sensitive than skull radiography, has confirmed that cerebellar and basal ganglia calcification occurs more commonly in patients examined in Queensland than in patients in North America. Although no distinctive neurologic syndrome could be demonstrated, the incidence of hypertension and hyperuricemia was increased in the affected patients, and serum creatinine levels were increased. Evidence suggests that cerebellar calcification is a marker of previous lead intoxication. The common occurrence of renal impairment in these patients may be the result of associated lead nephropathy. Subclinical lead exposure is associated with hyperuricemia. Schrote and associates reported a case of a 59-year-old potter who presented with lead polyneuropathy after 37 years of occupational exposure and noted that cranial CT showed extensive, bilateral, symmetrical calcification in the cerebellar hemispheres and minor calcification in the subcortical area of the cerebral hemispheres and basal ganglia. In addition, T2-weighted MRI showed high signal intensity in the periventricular white matter, basal ganglia, insula, posterior thalamus, and pons. Although the pathophysiologic mechanism of these findings remains poorly understood, it has been suggested that chronic lead exposure be included in the differential diagnosis of unexplained intracranial calcifications in adults. As with CT, MRI plays a minor role in the diagnosis of lead poisoning. However, cerebral edema and microhemorrhages may be seen in patients presenting with encephalopathy. With chronic exposure to lead, patchy calcifications may be seen on MRI scans (though these are better seen on CT scans). The symptoms of lead encephalopathy are mainly those associated with cerebral edema. Focal signs may predominate, mimicking a brain tumor in an area of generally diffuse brain edema. The developing brain is subject to major changes during fetal life, as well as for at least the first decade of childhood. Initially, the brain develops more neurons and synaptic connections than are needed for function in later life. These excess neurologic units are "sculpted" away during early brain development before the mature brain finally develops. This process is thought to be the basis for the plasticity of the developing brain or its capacity to adapt in behavior and circuitry in response to stimulation from the external environment. Trope et al found that that magnetic resonance spectroscopy (MRS) may have a role as a noninvasive technique for the in vivo examination of the brain of children exposed to lead. The authors examined 2 male cousins who were living in the same household. One, a 10-year-old boy, had elevated blood lead levels (BLLs). His cousin, a 9-year-old boy, had not been exposed to lead. Both underwent a comprehensive neuropsychological evaluation. High-resolution MRI and MRS were performed in both children by use of a 3-inch surface coil. Disrupted brain plasticity is not confined to cases of lead intoxication; other clinical disorders, such as metabolic and epileptic encephalopathies, as well as psychosocial deprivation, may be associated with disrupted brain plasticity. Ultrasonography is not routinely used in the diagnosis of lead intoxication, though transcranial sonography may be used to investigate congenital lead poisoning and lead intoxication in infant patients presenting with lead encephalopathy. The decrease in diastolic cardiac function was more significant in the lead-intoxication group than in the nonexposed group. In addition, the serum activity of the MB isoenzymes of creatine phosphokinase (CPK-MB), one of the indices of myocardial damage, was significantly higher in the exposed group than that in control subjects; a positive correlation was found between CPK-MB activity and Pb-B. These findings suggest that an increase in lead burden leads to an increase in the release of CPK-MB from the myocardial cells and that slight myocardial damage occurs, which might conceivably impair diastolic cardiac function. Tutar and associates described a case of a 12-year-old girl who presented with recurrent pericardial effusion caused by a firearm pellet injury to the left ventricle. A slightly elevated blood lead level (BLL) of the patient was alarming because of the possibility of subsequent lead poisoning associated with retained pellets. The pellet was localized by means of 2-dimensional echocardiography of the left ventricular apical wall. Because the patient was asymptomatic, left ventriculotomy was not used to extract the pellet; only pericardial tube drainage was carried out. Hollerman et al describe the substantial contribution radiologists can make to the evaluation and treatment of the patient with a gunshot wound. [29, 30, 31] Plain radiographs, CT, angiography, and sometimes MRI may all be used to localize the missile, to determine the path it followed in the body, to assess missile and bone fragmentation, and to identify missile emboli. Certain locations of missile fragments predispose the patient to lead poisoning or lead arthropathy. Meyer PA, Brown MJ, Falk H. Global approach to reducing lead exposure and poisoning. Mutat Res. 2008 Jul-Aug. 659(1-2):166-75. [Medline]. Interpreting and managing blood lead levels < 10 microg/dL in children and reducing childhood exposures to lead: recommendations of CDC's Advisory Committee on Childhood Lead Poisoning Prevention. MMWR Recomm Rep. 2007 Nov 2. 56:1-16. [Medline]. Woolf AD, Goldman R, Bellinger DC. Update on the clinical management of childhood lead poisoning. Pediatr Clin North Am. 2007 Apr. 54(2):271-94, viii. [Medline]. Rentfrow B, Vaidya R, Elia C, Sethi A. Lead toxicity and management of gunshot wounds in the lumbar spine. Eur Spine J. 2013 Nov. 22 (11):2353-7. [Medline]. Seo J, Lee BK, Jin SU, Park JW, Kim YT, Ryeom HK, et al. Lead-induced impairments in the neural processes related to working memory function. PLoS One. 2014. 9 (8):e105308. [Medline]. Pearl M, Boxt LM. 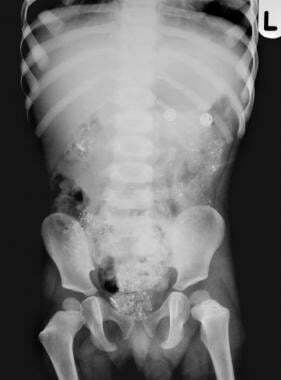 Radiographic findings in congenital lead poisoning. Radiology. 1980 Jul. 136(1):83-4. [Medline]. Balani A, Golla N, Dey AK, Mahankali S, Seelam S. Image of the month: Intracranial calcifications due to chronic lead exposure. Clin Med (Lond). 2016 Oct. 16 (5):494. [Medline]. [Full Text]. Tuzun M, Tuzun D, Salan A, Hekimoglu B. Lead encephalopathy: CT and MR findings. J Comput Assist Tomogr. 2002 May-Jun. 26(3):479-81. [Medline]. Flora SJ. Lead exposure: health effects, prevention and treatment. J Environ Biol. 2002 Jan. 23(1):25-41. [Medline]. Piomelli S. Childhood lead poisoning. Pediatr Clin North Am. 2002 Dec. 49(6):1285-304, vii. [Medline]. Albers JW, Bromberg MB. X-linked bulbospinomuscular atrophy (Kennedy''s disease) masquerading as lead neuropathy. Muscle Nerve. 1994 Apr. 17(4):419-23. [Medline]. Mennel EA, John SD. Osteosclerotic metaphyseal dysplasia: a skeletal dysplasia that may mimic lead poisoning in a child with hypotonia and seizures. Pediatr Radiol. 2003 Jan. 33(1):11-4. [Medline]. Sachs HK. The evolution of the radiologic lead line. Radiology. 1981 Apr. 139(1):81-5. [Medline]. Woolf DA, Riach IC, Derweesh A, Vyas H. Lead lines in young infants with acute lead encephalopathy: a reliable diagnostic test. J Trop Pediatr. 1990 Apr. 36(2):90-3. [Medline]. Specht AJ, Lin Y, Xu J, Weisskopf M, Nie LH. Bone lead levels in an environmentally exposed elderly population in shanghai, China. Sci Total Environ. 2018 Jun 1. 626:96-98. [Medline]. Specht AJ, Weisskopf MG, Nie LH. Theoretical modeling of a portable x-ray tube based KXRF system to measure lead in bone. Physiol Meas. 2017 Mar. 38 (3):575-585. [Medline]. [Full Text]. Specht AJ, Lin Y, Weisskopf M, Yan C, Hu H, Xu J, et al. XRF-measured bone lead (Pb) as a biomarker for Pb exposure and toxicity among children diagnosed with Pb poisoning. Biomarkers. 2016. 21 (4):347-52. [Medline]. [Full Text]. Hu H, Milder FL, Burger DE. X-ray fluorescence measurements of lead burden in subjects with low-levelcommunity lead exposure. Arch Environ Health. 1990 Nov-Dec. 45(6):335-41. [Medline]. Ahlgren L, Liden K, Mattsson S, Tejning S. X-ray fluorescence analysis of lead in human skeleton in vivo. Scand J Work Environ Health. 1976 JUN. 2(2):82-6. [Medline]. Reyes PF, Gonzalez CF, Zalewska MK, Besarab A. Intracranial calcification in adults with chronic lead exposure. AJR Am J Roentgenol. 1986 Feb. 146(2):267-70. [Medline]. Benson MD, Price J. Cerebellar calcification and lead. J Neurol Neurosurg Psychiatry. 1985 Aug. 48(8):814-8. [Medline]. Schroter C, Schroter H, Huffmann G. [Neurologic and psychiatric manifestations of lead poisoning in adults(case report and review of the literature)]. Fortschr Neurol Psychiatr. 1991 Oct. 59(10):413-24. [Medline]. Perelman S, Hertz-Pannier L, Hassan M, Bourrillon A. Lead encephalopathy mimicking a cerebellar tumor. Acta Paediatr. 1993 Apr. 82(4):423-5. [Medline]. Johnston MV, Nishimura A, Harum K, et al. Sculpting the developing brain. Adv Pediatr. 2001. 48:1-38. [Medline]. Trope I, Lopez-Villegas D, Lenkinski RE. Magnetic resonance imaging and spectroscopy of regional brain structure in a 10-year-old boy with elevated blood lead levels. Pediatrics. 1998 Jun. 101(6):E7. [Medline]. Trope I, Lopez-Villegas D, Cecil KM, Lenkinski RE. Exposure to lead appears to selectively alter metabolism of cortical gray matter. Pediatrics. 2001 Jun. 107(6):1437-42. [Medline]. Zou HJ, Ding Y, Huang KL, et al. Effects of lead on systolic and diastolic cardiac functions. Biomed Environ Sci. 1995 Dec. 8(4):281-8. [Medline]. Tutar HE, Atalay S, Uysalel A, et al. Recurrent pericardial effusion due to gunshot wound of the heart in ahemodynamically stable child--a case report. Angiology. 1999 Apr. 50(4):337-40. [Medline]. Hollerman JJ. Gunshot wounds. Am Fam Physician. 1988 May. 37 (5):231-46. [Medline]. Hollerman JJ, Fackler ML, Coldwell DM, Ben-Menachem Y. Gunshot wounds: 2. Radiology. AJR Am J Roentgenol. 1990 Oct. 155 (4):691-702. [Medline]. Hollerman JJ, Fackler ML, Coldwell DM, Ben-Menachem Y. Gunshot wounds: 1. Bullets, ballistics, and mechanisms of injury. AJR Am J Roentgenol. 1990 Oct. 155 (4):685-90. [Medline]. Blickman JG, Wilkinson RH, Graef JW. The radiologic "lead band" revisited. AJR Am J Roentgenol. 1986 Feb. 146(2):245-7. [Medline].